The floor of EGLX, Toronto’s biggest gaming tournament event extravaganza, features a number of fan activities including show floor demos from local devs and major publishers. Prominent among those was Nintendo, and among their offerings was a playable Viridian Forest from Pokémon: Let’s Go, Eevee! and Let’s Go, Pikachu!, after a considerable wait among serious pokéfans I got my hands on the Pokéball Plus controller for the Eevee version. While this is a remake of sorts for the first games of the series — Pokémon: Red, Green, Blue, and Yellow — there is a lot of the DNA of Pokémon Go, the mobile augmented reality game that everyone thought was a big deal and/or the future of the medium a few years ago. 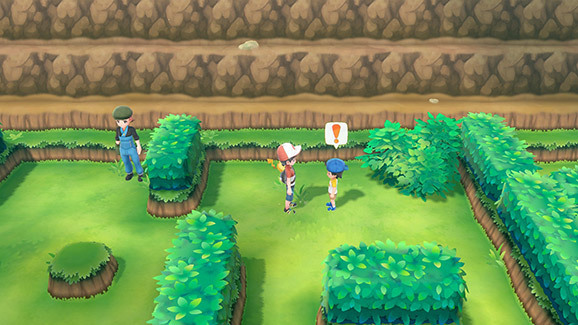 To start, wild pokémon finally appear on the map, mostly in tall grass, but some get aggressive and chase the player into traditionally safe zones. Once contact is made the game plays very much like Go. There’s no battle phase; the game just skips straight to tossing berries and balls and hoping for the best. 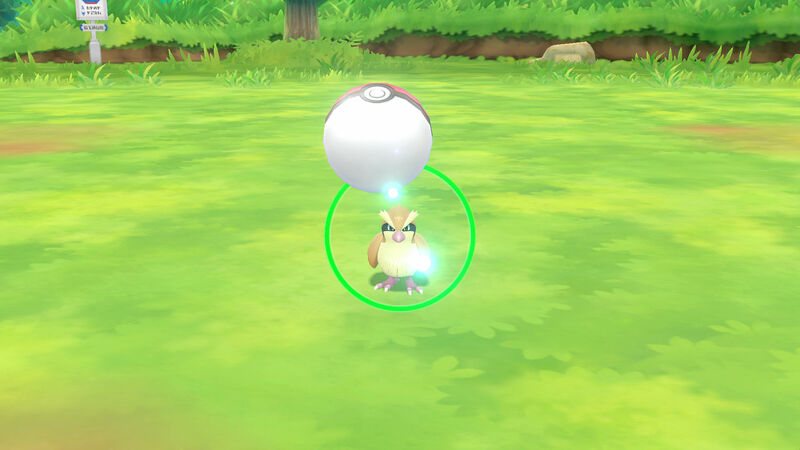 Once caught, all the monsters in the player’s party earn XP based on the quality of the throw, the quality of the pokémon caught, and few other factors that can turn 11 points from a pidgey into dozens of extra points. Another reminder of Go on your phone is that pokémon are different sizes, with bigger ones having better stats, but unlike the phone version tiny and huge pokémon have a visible aura on the field, which makes hunting for the best and rarest ‘mons much easier compared to the grid search and stat checking of the late nineties. Battles play out more familiarly to franchise veterans: an NPC trainer spots you, rushes over, and forces the player into monster fight. Fights are still turned-based with the classic music and the increasingly regrettable 8-bit monster cry sounds. While a remake, I was promised some updates in line with the way types and stats work in more recent titles. There were also some new attack moves on display. Eevee starts off with a fire type move called sizzly slide with a high chance of burn, while Pikachu gets a new electrical attack with a high chance of causing paralysis, suggesting that status effects may play a much bigger role in this title. Something to note about this being the first “real” Pokémon title to be playable on the big screen is that the screen is super legible. There’s tons of space for animations and explanatory text boxes, and the stats screen has all the data a trainer would want on one screen without any submenus or digging around to see everything relevant at once. The Pokéball Plus controller is small, like really tiny. I’m not any sort basketball player, rock climber, or jazz pianist but I feel like I could break this little thing without much effort. There are only two buttons of sorts on it: a large ‘B’ button under the red half of the ball and a teeny button under the bitty thumbstick (much like an R3 for most machines, I suppose) that acts as the A button. I did not dig this facet of the device, as it’s too easy to press too hard on the stick and enter the menu or hold the stick down too long and kick it over to ‘reconnect to console mode’. The actual motion control is sharp and responsive, just a quick jab of the controller to toss a ball in time with aiming ring. A feature alluded to by my PR rep is the ability to play dress-up with Pikachu and Eevee, and have it appear on-screen in battles and in the field. I did see Eevee dressed as Ash from the first season of the anime, but it’s not clear if this feeds into a new version of contests or anything else. Anyway, it is nice to be able to customize the experience in any way. Pokémon: Let’s Go Eevee and Pokémon: Let’s Go Pikachu, as well as the Pokéball Plus controller, will be released on November 16th for the Nintendo Switch.